The volumetric filler provides an adjustable shelf and offers the most flexibility when filling a broad range of bottle sizes. The variations in bottle fill volumes are within a consistent range in order to comply with the regulations set by the TTB (Alcohol and Tobacco Tax and Trade Bureau). Industries such as Distilled Spirits must comply with the strictest regulations which makes the volumetric fillers perfectly suited for their industry. Volumes are controlled by use of the digital timer. The user simply inputs the amount of time necessary to fill the bottle. For example, a 2 oz bottle might take 4 seconds to fill, a 275 ml bottle 13 seconds, and a 750 ml bottle 25 seconds (based on water). Times will vary according to the viscosity of the product. The digital timer is precise and adjustable down to .01 seconds, and the time is stored in the memory until changed by the user. 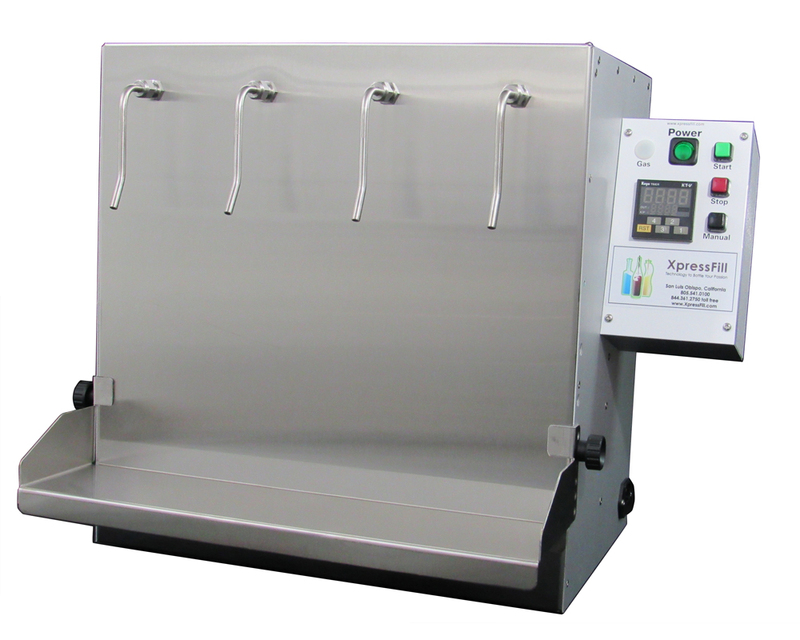 The Volumetric Filler is perfect for most liquids ranging from wine, distilled spirits, vinegar, liqueurs, olive oil, lotions and shampoos, depending on the viscosity. Each bottle filler is built to order in our factory. Lead times vary, ranging from one to four weeks. Please plan accordingly. Accommodates bottle sizes ranging from 5mL to 5 gallons. Suitable for viscosities ranging from water up to 500 cps. Accurate to 0.3% to comply with and exceed TTB regulations.